Regulated child care remains in short supply across Oregon, creating child care “deserts” in all 36 of the state’s counties, a new report from Oregon State University shows. Child care deserts exist when there are three or more children for a single regulated child care slot. Regulated care includes child care centers and home-based providers that are licensed by the state. Across Oregon, there are eight infants and toddlers ages 0-2 per slot, while there are three preschool-aged children, 3-5, for every slot. 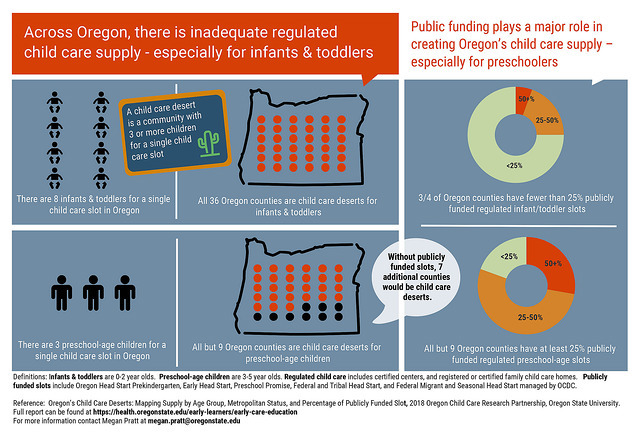 All 36 Oregon counties are child care deserts for infants and toddlers two and under. All but 9 Oregon counties are child care deserts for preschoolers. The report, “Oregon’s Child Care Deserts,” was commissioned by the Oregon Early Learning Division which partners with Oregon State on child care research through the Oregon Child Care Research Partnership. The report’s authors are Megan, Roberta Weber and Michaella Sektnan, all of OSU’s College of Public Health and Human Sciences. The report focuses on the availability of child care in Oregon and does not address issues such as quality or affordability of care, which are other factors that play a major role in child care decision-making. Care in Oregon is very expensive; the median annual price of care for a toddler in a child care center was $14,160 in 2018. The report is one of several prepared under the partnership in an effort to give educators and policymakers at the state and local levels accurate information about the state of early learning in Oregon. Earlier this month, Gov. Kate Brown kicked off the Raise Up Oregon plan in partnership with five state agencies to address, among other things, family access to quality and affordable child care. The inadequate supply of child care is not a new problem in Oregon; the Oregon Child Care Research Partnership has been studying the state’s supply since the 1990s. Oregon has seen a steady decline in child care slots in small family/home child care settings over the last 20 years. The number of slots in child care centers and large family/home child cares has begun to climb over the last few years. But growth has not kept pace with the growth in the population of children under 5. Informal care, typically provided by relatives, friends and neighbors to small numbers of children, is not regulated. The new report is the first to break down and map the availability of child care by age group and county, Megan says. The researchers also identified the percentage of those slots that are publicly funded through federal or state programs. The researchers found that overall, there is about one spot for every five children age 5 and under in Oregon. Across the state, about 19 percent of all slots are publicly funded through programs such as state- and federally-funded Head Start programs and the state-funded Preschool Promise program. Those spaces are typically available only to children from very low income families and most are aimed at preschool-aged children.